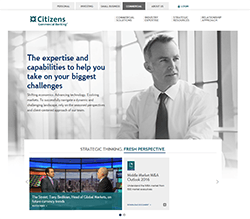 Citizens Commercial Banking offers its corporate, not-for-profit and institutional clients a broad range of wholesale banking products and services including treasury services, specialty finance, foreign exchange, capital markets and debt syndication. With broad experience ranging from traditional to asset-based loans, equipment finance to debt & equity capital markets, we have the expertise to structure the right financing for corporate clients. 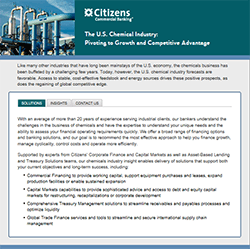 Please visit our industry and regional pages to learn more about our banking capabilities, including whitepapers, videos, industry outlooks and more. 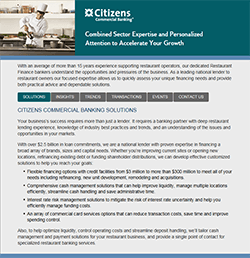 Citizens Commercial Banking, one of the nation’s leading commercial banking institutions, is a division of Citizens Financial Group Inc., one of the nation’s oldest and largest financial institutions. We help corporations, municipalities, real estate investors and non-profits build value. We partner with clients to create customized financial solutions to achieve their objectives, drawing from our comprehensive array of services including lending and deposits, capital markets, treasury services, foreign exchange and interest hedging, leasing and asset finance, specialty finance and trade finance. 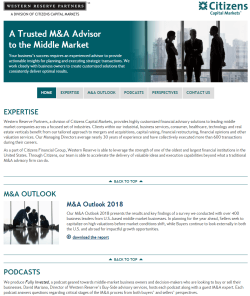 In planning for 2018 M&A, Sellers seek to capitalize on high valuations before market conditions shift, while Buyers continue to look externally in both the U.S. and abroad for impactful growth opportunities. In short, the time is now for mid-market M&A. 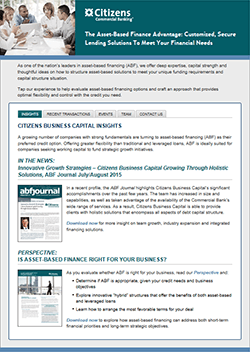 As a top-tier provider of equity and debt capital markets services, Citizens Corporate Finance and Capital Markets provides comprehensive financing, structuring and distribution services to support acquisitions, leveraged buyouts, dividend recapitalizations, restructurings, and short- and long-term refinancings. The Citizens Technology, Media & Communications Banking team provides differentiated, competitive debt financing, idea-driven capital solutions and traditional banking products to emerging growth companies, large well-capitalized corporations and private equity-backed portfolio companies. 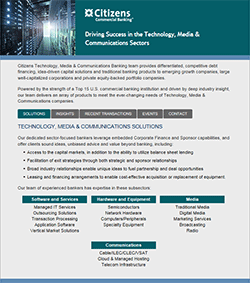 With expertise in software and services, hardware and equipment, media, and communications, our team provides products and solutions to meet the ever-changing needs of Technology, Media & Communications companies. With an average of more than 15 years experience supporting restaurant operators, our dedicated Citizens Restaurant Finance bankers understand the opportunities and pressures of the business. As a leading national lender to restaurant owners, our focused expertise allows us to quickly assess your unique financing needs and provide both practical advice and dependable solutions. 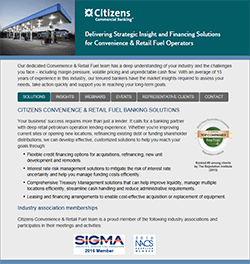 Citizens dedicated Convenience & Retail Fuel team has a deep understanding of your industry and the challenges you face – including margin pressure, volatile pricing and unpredictable cash flow. With an average of 15 years of experience in this industry, our tenured bankers have the market insights required to assess your needs, take action quickly and support you in reaching your long-term goals. With over 20 years of experience supporting government contractors, our dedicated team of bankers has earned a reputation for unparalleled responsiveness, objective and practical advice, and an in-depth understanding of what it takes to offer mission-critical and consultative services to government entities. 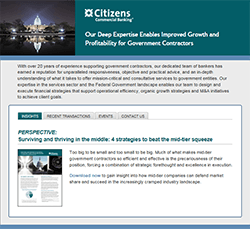 Our expertise in the services sector and the Federal Government landscape enables our team to design and execute financial strategies that support operational efficiency, organic growth strategies and M&A initiatives to achieve client goals. 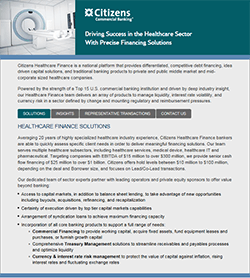 Citizens Healthcare Finance is a national platform that provides differentiated, competitive debt financing, idea-driven capital solutions, and traditional banking products to private and public middle market and mid-corporate sized healthcare companies. Citizens’ dedicated security alarm team has over 20 years of industry experience, and we are one of the few commercial banks serving the sector nationwide. 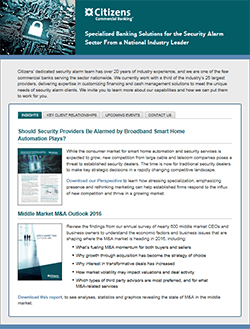 We currently work with a third of the industry’s 25 largest providers, delivering expertise in customizing financing and cash management solutions to meet the unique needs of security alarm clients. Like many other industries that have long been mainstays of the U.S. economy, the chemicals business has been buffeted by a challenging few years. Today, however, the U.S. chemicals industry forecasts are favorable. Access to stable, cost-effective feedstock and energy sources drives these positive prospects, as does the regaining of global competitive edge. In the last decade, the trucking industry has seen significant changes, from demographic shifts to sweeping technological innovations. To stay competitive, trucking companies have had to adapt, often by leveraging the value of their greatest physical assets. 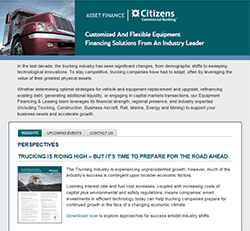 Whether determining optimal strategies for vehicle and equipment replacement and upgrade, refinancing existing debt, generating additional liquidity, or engaging in capital markets transactions, our Equipment Financing & Leasing team leverages its financial strength, regional presence, and industry expertise to support your business needs and accelerate growth. 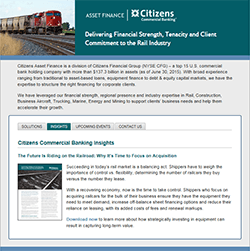 To meet the unique needs of the Rail industry, our Citizens Asset Finance team offers tax-advantaged secured term-loans, equipment leases and lease lines of credit for a wide range of assets – including railcars, locomotives, track, yard and MOW – on terms up to 15 years. We offer fixed or variable terms using Interest Rate SWAPS or LIBOR indices on transactions between $1MM and $150MM. 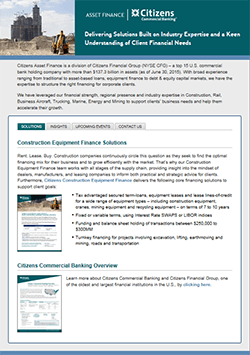 To meet the unique needs of the Construction industry, our Citizens Asset Finance team offers tax-advantaged secured term-loans, equipment leases and lease lines of credit to a wide range of segments – including Road & Highway, Public Works, Commercial & Residential Building, Mining, Oil & Gas and Dealers and Rental Companies – on terms of 7 to 10 years. We offer fixed or variable terms using Interest Rate SWAPS or LIBOR indices on transactions between $250,000 to $300MM. 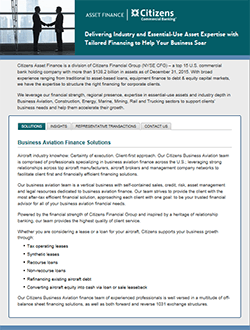 To meet the unique needs of the Business Aviation industry, our Citizens Asset Finance team offers comprehensive and competitive loan and lease options, as well as dedicated sales, credit, risk, asset management and legal resources to high net worth individuals, entrepreneurs and Fortune 500 Companies. 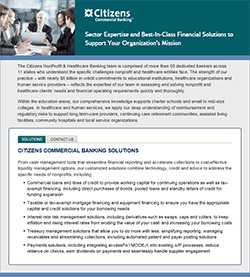 The Citizens Non-Profit & Healthcare Banking team is comprised of more than 50 dedicated bankers across 11 states who understand the specific challenges nonprofit and healthcare entities face. Within the education arena, our comprehensive knowledge supports charter schools and small to mid-size colleges. In healthcare and human services, we apply our deep understanding of reimbursement and regulatory risks to support long-term-care providers, continuing care retirement communities, assisted living facilities, community hospitals and local service organizations. At Citizens, we recognize the unique challenges that healthcare professionals face. 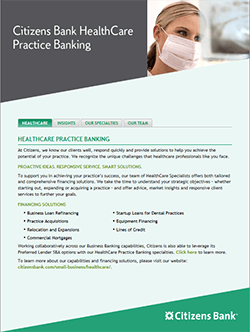 To support you in achieving your practice’s success, our team of HealthCare Specialists offers both tailored and comprehensive financing solutions. Offering both healthcare industry insight and an understanding of the unique needs of Dental, Medical, Eye Care and Veterinary practices, our HealthCare Specialists know what it takes to achieve financial success, at every stage of your practice.